I completed my nichos today. One of them anyway. The other (above) may need a little more 'glitz'. Inside the red heart, which opens, is a golden angel. Blanch created Our Lady of Guadalupe. The first time I saw Our Lady, years ago, in the Basilica in Mexico City, I fell in love. There is something about the image on the cloth ... old... historic. She captured my interest. She is beautiful. 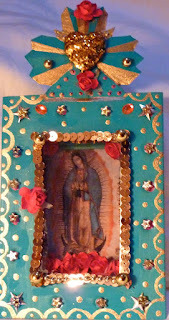 My turquoise nicho is also Our Lady. Another day disappeared quickly, like a lightening bolt. We wiled away the hours, chatting and laughing and creating. Another friend of Wendy's came today to join us. Blanch hales from Toronto. 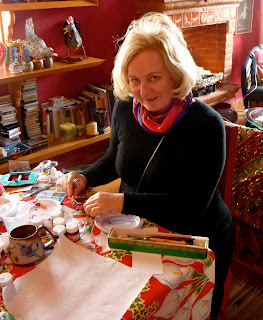 Five years ago, she and her husband bought a house in San Miguel. Today Blanch created her first nicho. Wendy and Blanch paint together. I have not seen Blanchs' paintings who prefers to work with acrylics. Wendy paints gorgeous little Mexican scenes in water colour which she turns into cards. I ordered some today. May's finished nicho was gorgeous. All those gold balls! May and I met in the Plaza today. I picked up four pork buns from my fabulous little pork vendor. We took the bus to Wendys. Bus fare is forty cents. I actually got 'bus' sickness! The ride was long and bumpy on the cobblestones. Getting out of my seat to disembark the vehicle while it's still moving is an experience. Making my way down the cramped isle is a life defying journey. While the bus careens wildly and unpredictably from one side of the narrow street to the other, I gingerly navigated the not only 'thin' isle, but one filled with school children. Baby step by baby step, hanging on for dear life to whatever I could cling to, I grabbed whatever might steady me, including unsuspecting passengers. The children in the isles found it incredibly funny and were doubled over with giggles by the time I actually set foot on solid ground. After riding for about half an hour, I found my legs shaking beneath me when I hit the cobblestones. It rather felt like I had been on a ship, and needed to get my 'land legs' back. Motion sickness had overtaken me. Next time, I think a small piece of gravol might be in order. We all enjoyed our pork buns, 'con todos' (with everything) for lunch. Wendy cooked a tasty chicken soup, with rice, fresh vegetables and cheese, accompanied by tortillas for dinner. May brought strawberries and cream for dessert. Wendy drove us all home. I made it up my thirty steps about 8:30 pm, tired and content. While I waited for May in the square this morning, children played with bubbles. I caught this photo. Cloudy with sunny periods. Windy with rain. High of 61 degrees F. Low of 40 degrees F. Humidity 82%. * Bring on the Celebrations! 8 Principles for Having More FUN! * Lift off is TODAY! !